Jean-Pierre Melville's mission seems to have been to distill the crime movie to its essence, to the point of irreducible complexity, and this film may be the leanest, most spare gangster picture ever made. It's got an understated elegance to it; it's all story, not brimming with character or plot, but investing instead in small gestures, and in a certain kind of filmmaking style. Melville doesn't go in for shoot-'em-up pyrotechnics, or for sweeping assessments of the human condition; rather, he's made a decidedly existentialist crime movie, and if gangster philosophy isn't your thing, there's always the chiseled profile and deep blue eyes of Alain Delon, who wears a fedora as well as anyone since Humphrey Bogart. The police do in fact pick him up, along with dozens of others, and Melville's fascination with procedure is very much on display, as the hordes of suspects are trotted out for the witnesses to size up and discuss, with nary a concern for the Miranda niceties we in the U.S. have come to accept as a matter of course. Jef's alibi is airtight�his beautiful girlfriend will vouch for his presence in her apartment at the hour of the crime�but still, Jef is getting it from both sides: the cops sense that something isn't right, and the forces that hired him, who overpaid for a promised clean getaway, want to cut any connections between them and the crime. As is so often the case in Melville's movies, our hero is a lone wolf, one who can trust only his own counsel, who knows that there isn't in fact much honor among thieves, and who has a fatalistic sense about the manner in which things will end. Image Transfer Review: The palette is dulled down, as is the case with many films of this period. Criterion's transfer, though, is strong, especially on modulating contrast and in preserving the starkness of so many of Melville's images. Extras Review: The Melville lovefest? It's on. In 2003 interviews, Melville on Melville author Rui Nogueira (12m:59s�in French) and film historian Ginette Vincendeau (18m:41s�in English) discuss the director. Nogueira's is a straight-up valentine; Vincendeau discusses Melville's technical accomplishments, and his films as a necessary precursor to the nouvelle vague. They agree that this film is a pinnacle of sorts for him. Collected under the overly cute heading The Lineup is a collection (24m:11s all in) of six clips from French television, ranging from 1967 to 1982, including an extended piece of Melville looking particularly corporate behind a huge desk, and one of Delon appearing on a talk show days before the film's Paris opening. The accompanying booklet features essays by David Thomson and John Woo, along with an excerpt from Nogueira's book. Also, this is the first Criterion title I've reviewed since the company was acquired by Image Entertainment�perhaps it's simply an unfortunate coincidence and only anecdotal, but the cover insert for this title came badly puckered and poorly fitting. One hopes that this is an anomaly, and not a harbinger of a decline in the quality we've come to expect from Criterion. 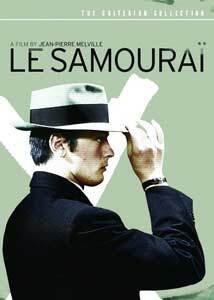 Jean-Pierre Melville here reduces the crime-picture genre to its sparest possible incarnation, and the result is a moody, atmospheric, graceful story, imbuing the sordid world of hit men with an almost religious fervor. Alain Delon is hypnotic in the central performance, and in the Criterion Collection, Melville has a worthy co-conspirator.